Over the last year or so I have had the privilege of reading several atypical educational books that use graphic art to help teach difficult concepts or illustrate the action. This is another wonderful entry in the “Manga Guide to…” series that I have been reviewing. 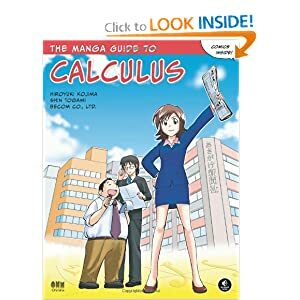 The Manga Guide to Calculus follows the actions of a young newspaper reporter, Noriko, who wants to cover the big stories, to be a hard-hitting reporter who uncovers and reveals hidden facts about world affairs, the economy, and politics. She is saddened to discover that she has been assigned to work a small post in a small area where she is unlikely to find stories bigger than the opening of a local amusement park or the improving reputation of a local watermelon grower. However, her time is not wasted. The bureau chief is a lover of mathematics, and specifically calculus. Noriko is shocked to discover that calculus can help her become a better reporter by assisting her to discover trends in data that might otherwise have been overlooked. This story line makes the discussion of very complex and sometimes difficult to grasp mathematical concepts much easier by framing the discussion in ways I have never seen. In my experience, a typical calculus class will start with mechanics like how to compute a derivative or somewhat esoteric sounding concepts like lines tangent to curves without giving a clear background as to why these things might be meaningful or useful. That usually comes much later, after a large number of students have been weeded out because of disinterest or an unwillingness to learn difficult concepts without knowing why they might be important. What this book does better than any calculus book I have seen is give a context to the processes and concepts. The story line is enjoyable, but more importantly it serves the function of enabling a reader to understand how the mathematics help solve problems or answer questions that are useful and relatable. That in itself is a great and useful accomplishment and makes the book worthy of a recommendation. The book covers a large number of concepts. As a result, none are covered in exhaustive depth. I would not consider this a primary text or useful for learning calculus alone, but rather as an accompaniment to a course, useful for review or assistance in understanding concepts as they are learned. Some of the topics covered are using functions to approximate data, such as fluctations or trends in prices, calculating relative error and calculating the derivative of constant, linear, quadratic, composite, inverse and other functions. Norika learns how to use different techniques for differentiation while discovering the importance and usefulness of knowing the maxima and minima for a given formula. Not long after these and other foundational aspects are learned, Norika finds out about the fundamental theorem of calculus and learns to integrate using supply and demand curves and later trigonometric functions. Finally, she discovers Taylor Expansion, distributions, and partial differentiation, especially as applied to economics. The book includes exercises in each section with solutions in the back of the book. Again, there aren’t enough practice problems for this to be useful as a primary teaching text, but what is there is useful for confirming that the concept just discussed is clearly understood and would be helpful as a review. I would have preferred to see more examples of calculus in use in other sciences, like physics, but this is a short book that is intended to be an overview of the topic and not an extensive or exhaustive presentation. It is also fair to note that the Manga Guide to Physics does use some calculus in it, although not much. These are books aimed at people finishing high school or just starting at the university and I think they hit their target well, confining themselves to discussions within well chosen boundaries to make sure that the intentionally and necessarily narrower set of concepts may be discussed clearly and completely enough for good understanding. Where I went to Uni I was never taught why Calculus was useful even after taking 4+ Calculus classes. It was all just rote memorization, and at this point I have forgotten most of it. No one, in the entire time I was at Uni, ever explained how it could be useful for anything other than to get a good grade in class. I think my Uni must have just sucked.